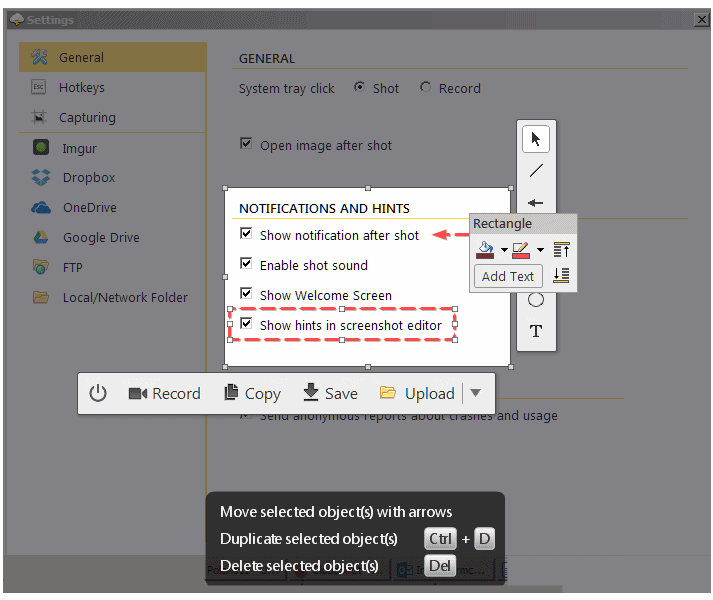 CloudShot is a screen-capture program with edition and upload options. The program can capture individual screen selections or a short (60 second max) animated GIF. For images, you can crop, add arrows, boxes, notes etc. and then saved to a local or remote destination. Upload services supported include FTP, Imgur, Dropbox, OneDrive or GoogleDrive. How to extract: Download the "Portable version" ZIP package and extract to a folder of your choice. Launch CloudShot.exe. To save files captured to the local folder, open Settings and choose Local/Network folder, Save location and paste ./Captures (thanks tproli). Under network folders if you click to open gallery, it throws an exception. Enter "./Captures" to the "Settings->Local/Network folder -> Save location" to save captures/recordings to the application folder.